Here at Little Unicorn, we’re about the good stuff. Our goal is to create quality goods with nostalgia and function that will support your current lifestyle needs. We aim to add a little magic to the mix and make it affordable, because giving comfort to your baby and bolstering confidence in parenting shouldn’t pillage your pocket. We even dare to provide pleasant customer service with authenticity; we are committed to do what it takes to keep you pleased. 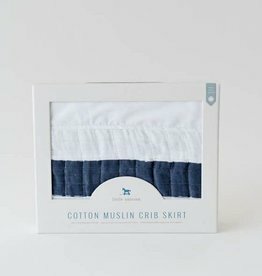 A muslin cotton crib skirt to complement your nursery’s look and feel.